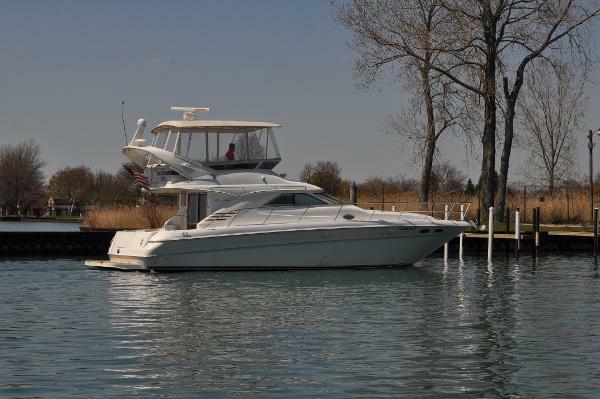 2000 Sea Ray 400 Sedan Bridge New to market! 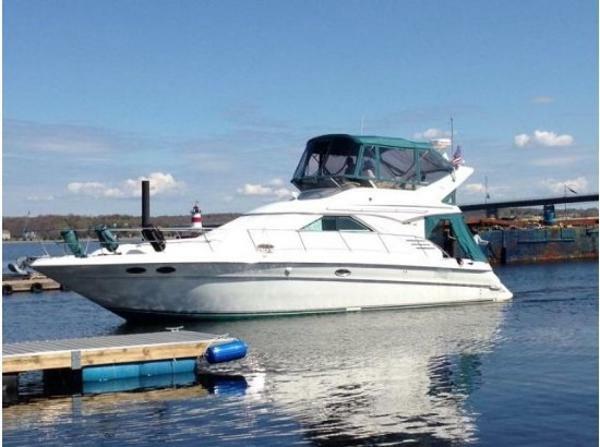 This well cared for Sedan Bridge features twin Caterpillar diesels, Westerbeke generator, Raymarine electronics, large salon for entertaining and 3 staterooms with all the comforts of home! Just bring your toothbrush, she's ready to go! 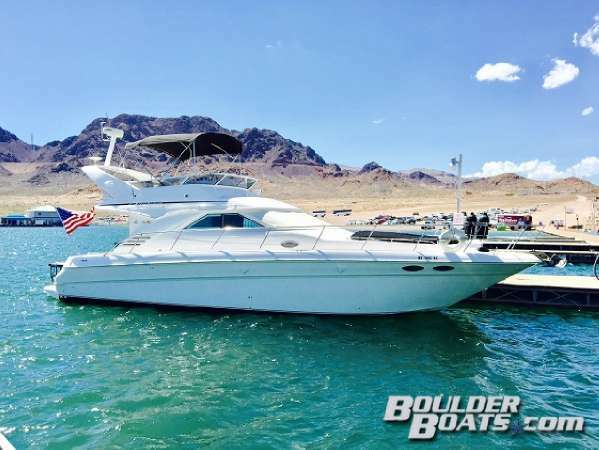 1998 Sea Ray 400 Sedan Bridge (CURRENT OWNER OF 4-YEARS) BOASTING ALL OF THE MOST SOUGHT AFTER OPTIONS, PRIDE OF OWNERSHIP SHOWS THROUGHOUT IN THIS 1998 SEA RAY 400 SEDAN BRIDGE -- PLEASE SEE FULL SPECS FOR COMPLETE LISTING DETAILS. LOW INTEREST EXTENDED TERM FINANCING AVAILABLE -- CALL OR EMAIL OUR SALES OFFICE FOR DETAILS. Freshwater / Great Lakes boat since new this vessel features Twin Caterpillar 3116 340-hp Diesel Engine'S. 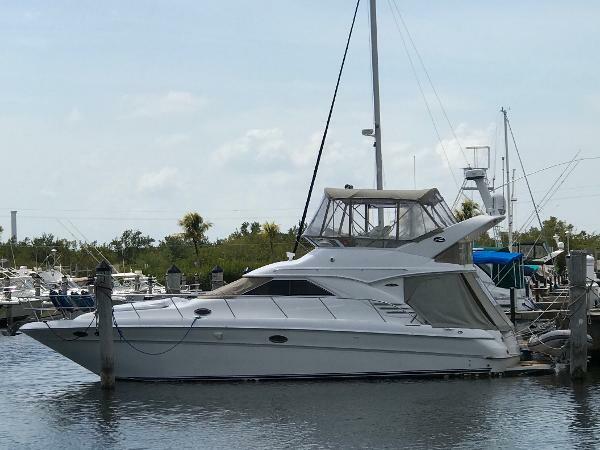 Notable features include but are not limited to the following: Air-Conditioning & Heat (2-Units), (2) Heads (Vacuflush) w/Vanity/Sink/Stall-Shower, Central Vacuum, Windlass Anchor w/Forward Pedal Controls, Westerbeke Generator (284-hours), Complete Electronics Package (Raymarine C120 Radar w/GPS/Chartplotter, Raymarine Autopilot), Bow-Thruster, Satellite-Television w/Upgraded LCD-Television's, Custom Fly-Bridge Enclosure w/Tubular Aluminum Top w/White "Stamoid" & Full Strata Glass Surround, NEW Fly-Bridge Snap-in Snap-out Carpeting, Aft-Deck & Swim Platform Wood Sole, and MUCH more! 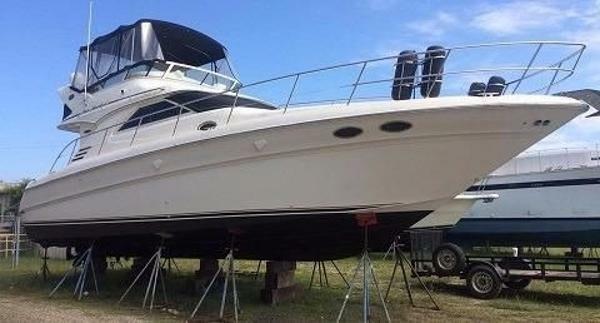 Broker Notes: Rare find with Twin CAT Diesel's and the following options (in no specific order): Custom Fly-Bridge Enclosure w/Rigid Tubular Aluminum Top & EZ2CY Bridge Enclosure, Custom Wood Sole (Aft-Deck, Swim Platform, Steps to Fly-Bridge), Bow-Thruster, Satellite-Television, Custom Wood Sole in Galley, Upgraded Raymarine Multi-Function NAV System. Neutral decor shows in above average condition, 2017 Professionally Polished/Waxed ... Pride of ownership is evident throughout. Highly recommended by listing agent! 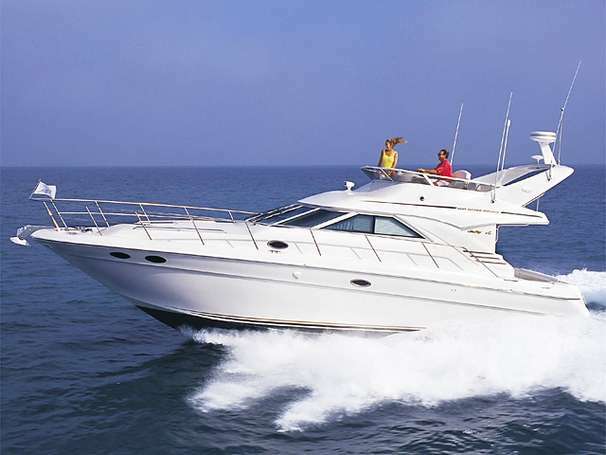 The PowerBoat Guide had this to say:Quality-built sedan introduced in 1996 combined rakish styling, expansive cabin accommodations, strong performance. Offered with choice of floor-plan layouts -- Plan A includes three staterooms with salon galley and dinette; Plan B has two stateroom with the galley down, port-side lower helm. Note spacious bridge. Fully cored hull has prop pockets to reduce draft. Twin 370hp gas inboards cruise at 20 knots (26-28 knots top). 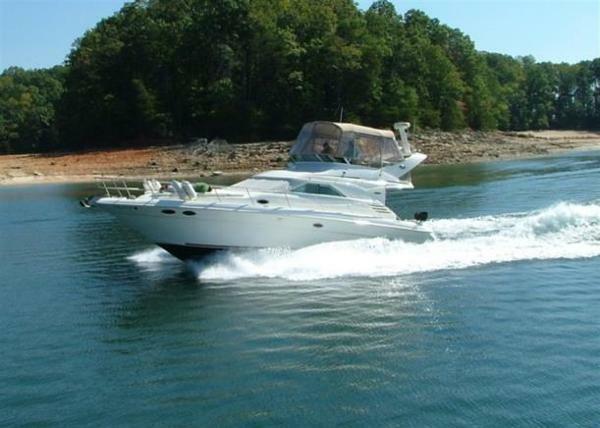 2002 Sea Ray 400 Sedan Bridge "Sea Mama" is a well maintained Sea Ray 400 Sedan Bridge with all the right options. Cummins 6 CTA's, Westerbeke Generator, Bow Thruster, Cherry Interior, Updated Garmin GPSMAP, custom faux teak decks, full aft enclosure, and much more. Two stateroom, two head layout with galley down makes for a timeless cruising and spacious interior. PRICED VERY COMPETITIVELY, OWNER WANTS HER SOLD ASAP. 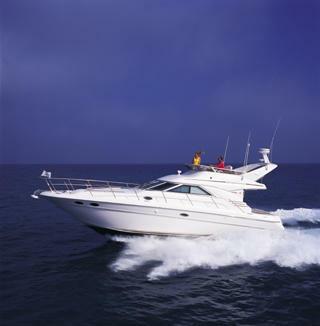 The Sea Ray 400 Sedan Bridge is set off by her rakish lines and swept back profile. This two stateroom layout with fiberglass radar arch, full bimini and enclosure, forward helm for better visibility and easier manuverability make this vessel an excellent choice. 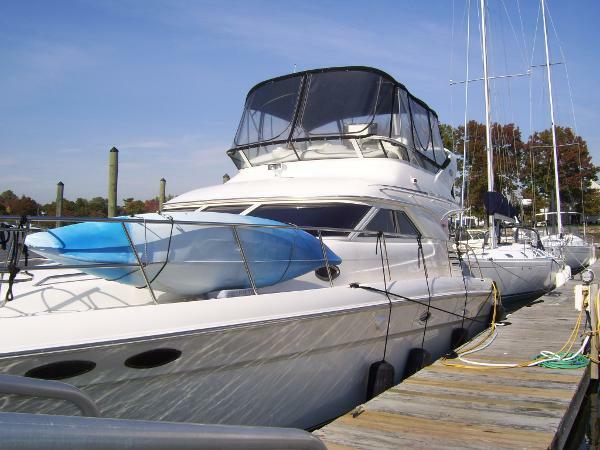 1997 Sea Ray 400 Sedan Bridge PRICE REDUCED!!!!!! It's been said the Sea Ray 400 Sedan Bridge is one of the sexiest boats on the water. This boat is definitely a very nice motor yacht. It is in excellent condition and has been professionally maintained. She is a roomy and comfortable Motor Yacht with a lot of amenities. She is powered by twin 454s and has a 4.5 Westerbeke Generator. In the past few years she has had upgrades. In 2013, she was pulled, inspected and fresh bottom paint applied. The salon and main state rooms have new flat screen TVs. New Bose Sound System in Salon. Replaced Stereo Speakers with Polk Audio, Sub and Amp. Replaced Galley Frig/freezer and microwave. Installed New Purisan System, (Coast Guard Approved) 2 new Raritan Marin Elegance Heads. Installed new Plotter/GPS, etc. at the helm. Installed new frig at helm. Replace anchor with a polished stainless steal swivel plow. Additional items with boat are, Lofrans Windless, 25' of anchor chain with 150' of rope, Richie Compass, VHF Marine Radio, Dept Sounder, GPS, Engine Synchronizer, Search Light, Sea Fire / Fire Extinguisher, CO Monitor and Central Vac. This Motor Yacht is a must see. 2002 Sea Ray 400 Sedan Bridge Dreams fade, but Memories last forever. Check out the video! Great way to start the new year. Price dropped to $179,900 Brand new carpet in the cockpit. World class cruising in a timeless elegant sedan bridge. Lavish interior with high gloss cabinetry including two heads and 2 staterooms with bulkhead compartment doors, electrically convertible salon sleeper/sofa, huge galley with large refrigerator, three burner stove, and microwave / convection oven. Top side features include superb helm position, posh U-shaped cockpit seating with outstanding fit and finish throughout. Repowered in 2005 with twin Cat C7 diesel engines, 8KW Westerbeke diesel generator. 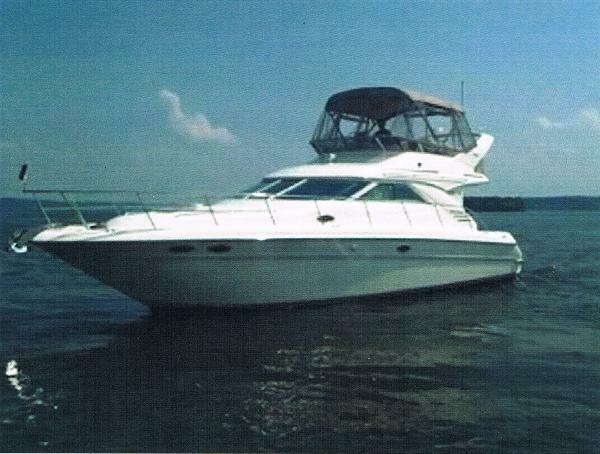 1998 Sea Ray 400 Sedan Bridge Preliminary Listing! Freshwater Only, Serviced, Upgrades! 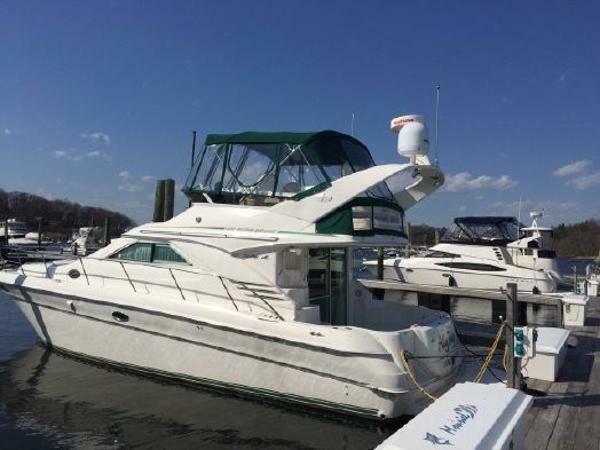 1999 Sea Ray 400 Sedan Bridge Don't miss out on this two stateroom two head Sedan Bridge that Sea Ray got right! 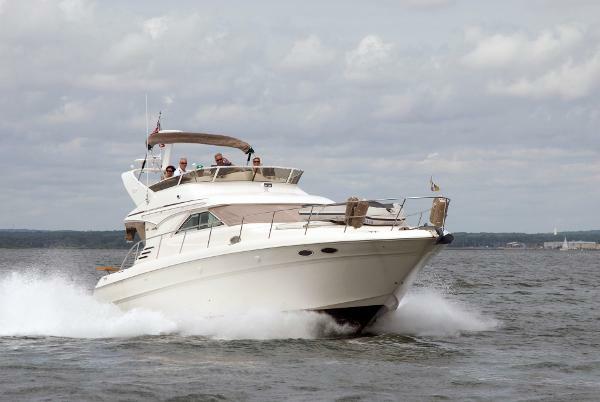 A very popular cruising yacht with a nice blend of European styling with all the luxury class amenities that we have come to expect from Sea Ray. 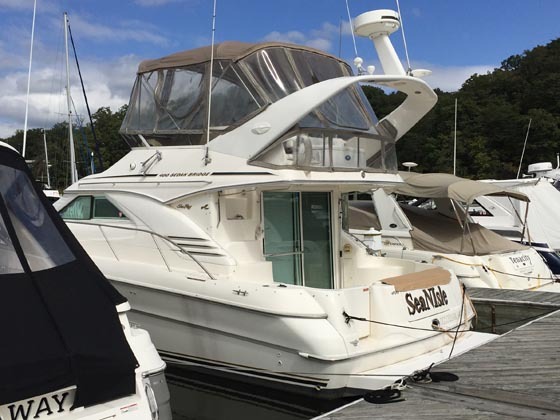 This single owner Captain driven vessel has been professionally maintained by both the Captain and Marine Services Corps, where she sleeps in heated storage during the winter months. Actual Photos Coming Soon! 2003 Sea Ray 400 Sedan Bridge Bow/Stern Thruster This yacht is in great great condition and loaded with many extra's, custom bridge flat panel Samsung TV, Magna BBQ, Reverso oil change system, Aft cockpit enclosure, Bow and Stern Thrusters (Lewmar), New Microwave, Electric sofa bed, Radar, GPS, Auto pilot, Fish Finder, VHF w/remote speaker, Remote spot, central vac, 8KW Westerbeke Gen. Clarion stereo w/CD changer, (2) Full heads with stall showers, Cherrywood inerior, full bridge enclosure, 3 TVs and maintained to the fullest. 1997 Sea Ray 400 Sedan Bridge REDUCED 20K FOR QUICK SALE * Bristol Condition * Trades Considered * This 400 Sedan Bridge, "Captain's Lair" sets the bar for Excellence in Appearance & Condition. She is as near perfect as you will find. Her owners, a Naval Family, know how to keep a boat. They have meticulously maintained this vessel and continue to update her mechanically as well as cosmetically. Their plans for approaching retirement include more yachting adventures on a larger Sea Ray Sedan Bridge. Please call for more details or better yet arrange for a showing. You won't be disappointed and might just save yourself some running around!